Banksy is at it again and this time he is drawing attention to the Syrian refugee crisis. 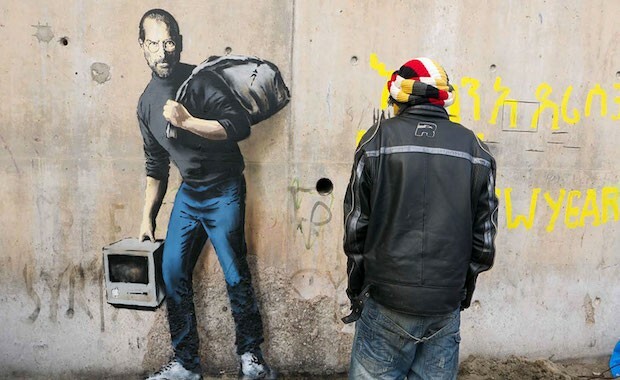 The British street artist has painted an image of the late Steve Jobs, Apple founder and the child of a Syrian refugee, on a wall in France’s infamous Calais refugee camp. Jobs can be seen standing with an original Mac computer in one hand and a sack over his shoulder. The piece, titled “The Jungle,” is “intended to address negative attitudes towards the thousands of people living there,” shared The Guardian. Banksy, while normally quiet about his artwork, left a rare statement explaining the piece. Banksy has been very passionate about supporting the refugee crisis in Syria. After his summer exhibit, “Dismanland Bemusement Park” closed, he sent the leftover infrastructure to help build emergency housing for the migrants now living in Calais.